Each of our courses are designed to offer a unique Whistler running experience, one that will leave you with a taste of the true personality of this mountain town. All courses are a hybrid of both paved and gravel surfaces, offering you the best that Whistler has to offer. 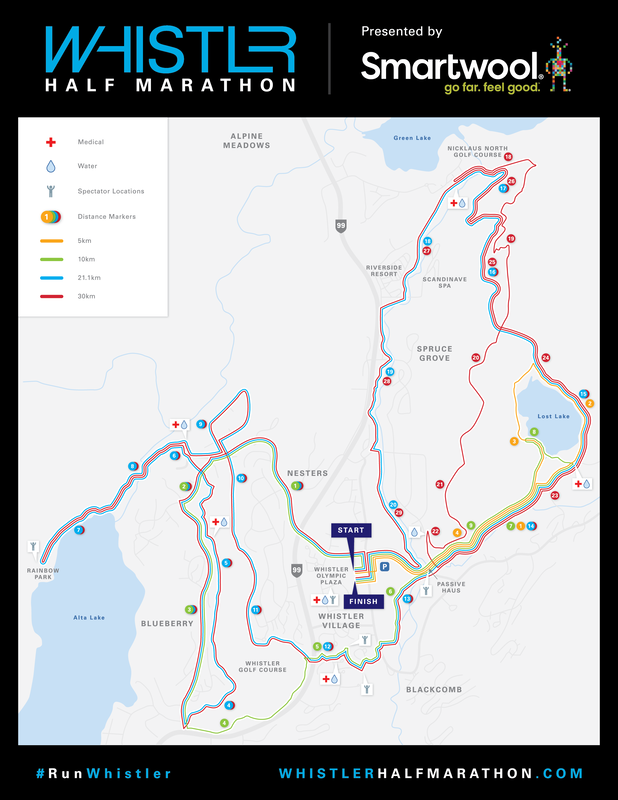 From stunning views of our glacier capped mountains and crystal clear lakes, to our neighbourhoods and the heart of Whistler's amazing alpine village, no matter what event you choose to participate in; you will be glad you did! Join us in the distance of your choice - we promise an event as world class as the resort it is set in. Gather your running partners, friends and family - we have something for everyone. Each of our distances start and finish at Whistler Olympic Plaza, site of the medal ceremonies for the mountain events at the 2010 Winter and Paralympic Games. By Car: From Vancouver/Squamish, travel north on highway 99, turn right on Lorimer Road, continue straight through the intersections with Northlands and Blackcomb Way. Enter the municipal parking lots on the right hand side. Once parked, proceed to the stairs leading up the berm, and Whistler Olympic Plaza is located directly across the street. Half Marathon - 250m elevation gain total.